2-3" long golden yellow sausage-shaped fruits. 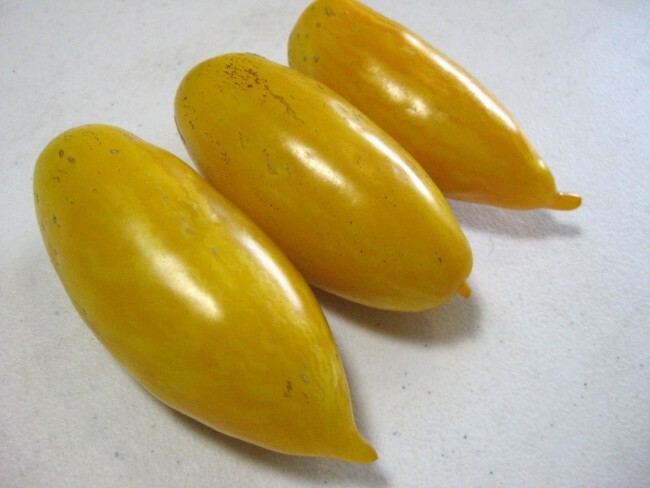 Large determinate plants with wispy regular foliage, high yield of 2-3" long golden yellow sausage-shaped fruits with a tip at the blossom end and faint striping that disappears when fully ripe. Mid- to late season. The plants may be thought of as indeterminate, since they are quite vigorous, but at the end of the season the branches end with flower trusses, which means they are actually determinate. Very meaty flesh with very few seeds. The flavor starts out mild at the beginning of the season, but gets very rich later in the season, sweet with a hint of citrus. We were quite impressed with the taste.